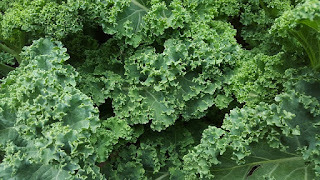 Any kale can be used for this recipe, Cavalo Nero is a favourite of mine though Kurly or Russian kale works just as well. A clever combination of miso & garlic gives this vegetable a nice lift that is especially appreciated by the end of the growing season. Kale has recently made the 'Dirty Dozen List', meaning it is one of the 12 fruit and veg exposed to the most herbicides and pesticides during it's production, so eat organic when possible and wash well. In a wide pan heat oil, add garlic and cook for 3 minutes, taking care not to brown the garlic. Add kale, stock, miso & chilli flakes. Cook covered over low heat, approximately 10 minutes.